Several hundred stone tools attributed to Neandertals in Gorham’s Cave (to the lower right), on the rugged Mediterranean coast near the Rock of Gibraltar were found after a six year dig. The tools and charcoal remains were dated to be 28,000 years old, meaning that Neandertal’s last known occupation was at this cave before being wiped out. An example of a tool found at the site is an image of a spearpoint located to the right. 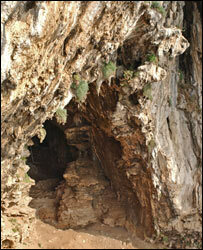 The dig was lead by Clive Finlayson of the Gibraltar Museum, who anounced the findings to the public yesterday. Finlayson and his team of Spanish archaeologists started excavating the cave in 1999. By 2005, they had penetrating several layers with evidence of Neandertal occupation…specifically, “they had excavated more than 60 square feet of the cave floor”. The stratigraphic depth of the layers indicated that the cave was home to Mousterian toolmakers over a long stretch of time. “In an accompanying commentary in Nature, two paleontologists not involved in the research, Eric Delson and Katerina Harvati, agreed that the date of 28,000 years ago was ‘later than any other well-documented supposed Neanderthal occurrence.’They added a note of caution, saying that while Gorham’s Cave ‘might well pinpoint the newly extended end of a long lineage’ of Neanderthals in Europe, only ‘time will tell’ if the findings are correct. Dr. Delson is a paleontologist at Lehman College of the City University of New York and the American Museum of Natural History. Dr. Harvati, an evolutionary scientist, is a specialist in Neanderthal research at the Max-Planck Institute for Evolutionary Anthropology in Leipzig, Germany. Recently revised dating shows that anatomically modern Homo sapiens migrated to Europe from Africa by 35,000 years ago and over time they displaced Neanderthals, who had lived on the continent for about 200,000 years. Check out John Hawks for more goodness.